Welcome to the Australia’s first “Master Chef Style” Indian cooking competition. 24 contestants battle in the kitchen over 8 weeks to win part of the $8000 in cash and prizes. Premier Tickets is Australia’s leading online event ticketing & marketing solution provider. We act as a channel between the event organizers and end customers helping our clients with hassle free event ticket booking, event marketing & promotion solutions. 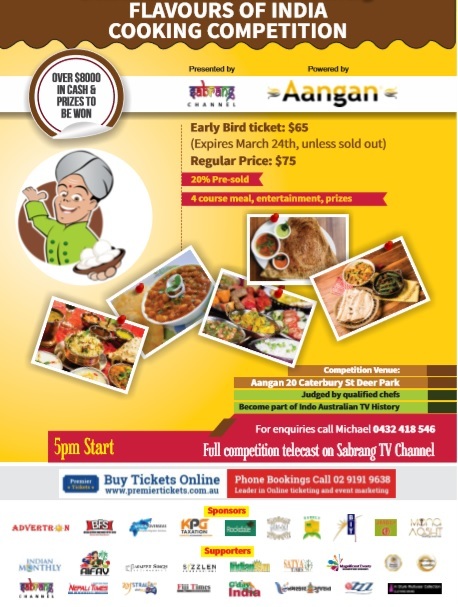 Contact us for any of your ticketing & marketing needs for The Flavours of India – Cooking Competition Finale.